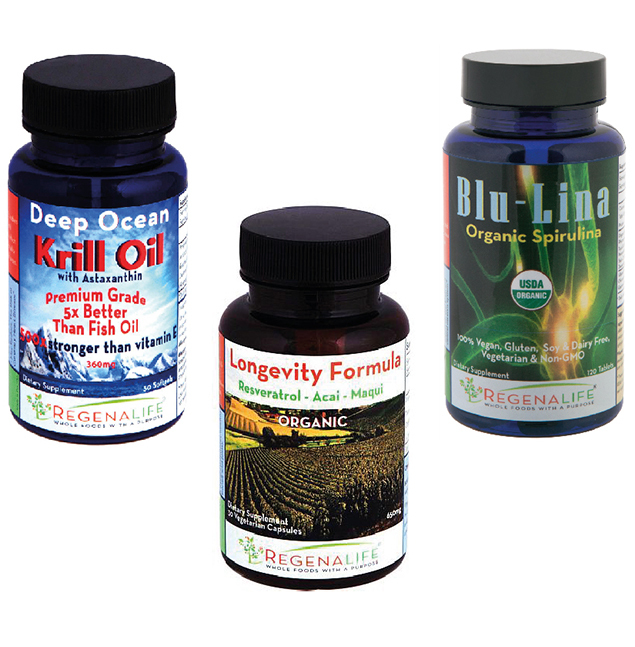 RegenaLife's krill oil contains naturally occurring long-chain omega 3 fatty acids; EPA (eicosapentaenoic acid) and DHA (docosahexaenoic acid). These phospholipids are superior to the triglycerides found in fish oils, being easily absorbed. 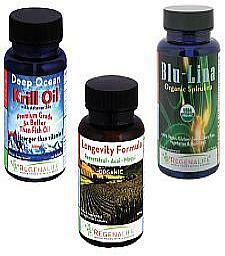 This reduces the fermentation and burping problems commonly associated with fish oil supplementation. Antarctic krill is rich in the antioxidant astaxanthin, which gives the oil its characteristic red color. Astaxanthin is a natural carotenoid-type of antioxidant that is even more powerful than beta-carotene, alpha-tocopherol, lycopene and lutein. 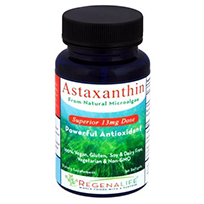 Astaxanthin naturally quenches free radicals, keeping the product fresh. 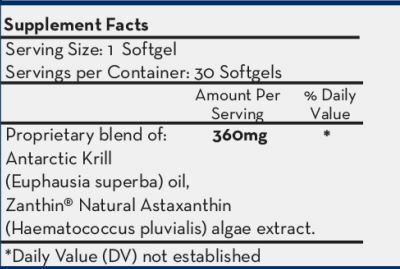 Thus, no additives are necessary to maintain krill's long-term stability. By comparison, antioxidants are added to most dietary supplement fish oils to prevent them from going rancid during production or on the shelf. 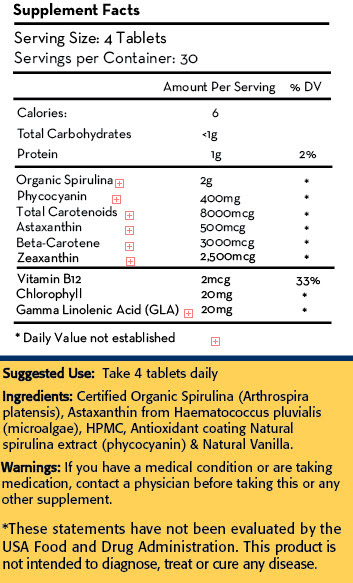 Spirulina contains unusually high amounts of vegetable protein (3-4 times higher than fish or beef) and iron, which may be particularly useful for vegetarians. Spirulina contains all 8 essential amino acids. It is rich in vitamins, minerals, enzymes and anti-oxidants. It contains high levels of phycocyanin, carotenoids which protects cells (5 times more than carrots, 40 time more than spinach), and high volumes of essential fatty acids (which may reduce cholesterol and prevent heart disease). Spirulina contains 65% protein and amino acids including the essential fatty acid gamma linolenic acid (GLA) which has gotten a lot of attention for its anti-inflammatory properties. 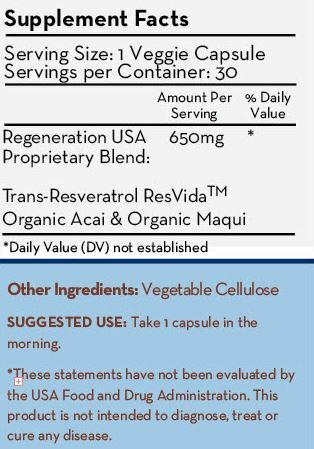 RegenaLife's Longevity Antioxidant Formula was designed to produce the strongest antioxidant and anti-aging results possible; featuring Resveratrol, Acai Berry and Maqui Berry. There's no dietary supplement on the market like it today – it's an Anti-Aging Powerhouse! Free of wheat, processed sugars, syrup, gluten, corn, salt, hydrogenated oils, soy, rice, barley, dairy, egg, yeast, caffeine, synthetic sweeteners, artificial color, fragrance, preservatives, monosodium glutamate (MSG), and genetically modified organisms (GMOs).